Sisters Esme, Katy, and Ronnie are smart, talented, and gorgeous, and better yet . . . all three are witches. They have high school wired until the arrival of two new students. The first is Norman, who is almost eight feet tall and appears to be constructed of bolts and mismatched body parts. Despite his intimidating looks, Esme finds herself strangely -- almost romantically -- drawn to both his oversized brain and oversized heart.The second new arrival is Zack, an impossibly handsome late transfer from the UK who has the girls at school instantly mesmerized. Soon even sensible Esme has forgotten Norman, and all three sisters are in a flat-out hex war to win Zack. But while the magic is flying, only Norman seems to notice that students who wander off alone with Zack end up with crushed bones and memory loss. Or worse, missing entirely.HEARTS & OTHER BODY PARTS is a wickedly addictive novel about love, monsters, and loyalty. And oh yeah, a Japanese corpse-eating demon cat. 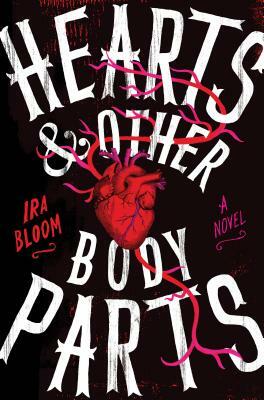 Ira Bloom makes his literary debut with Hearts & Other Body Parts. Previously, Ira was a teacher of junior high English, ESL, and Japanese for the Los Angeles Unified School District. Ira and his wife currently operate a fashion and vintage kimono business, and he is something of an expert on Japanese textiles. Ira lives in Northern California with his family and an assortment of furry beasts. None have proven to be demons . . . yet.